Joy Creek Photo Archive (c) all rights reserved This ornamental grass was developed by Brent Horvath from Intrinsic Perennial Gardens in Illinois. We have grown it for many years and have been very impressed with its large, reddish bottlebrush inflorescences which it holds high in its foliage. The color of the inflorescences is slow to fade. 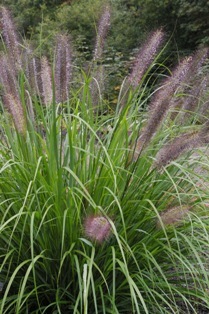 Another asset of Pennisetum alopecuroides `Red Head' is the exceptionally upright foliage. As the cool of autumn approaches, the leaves take on attractive tawny tones. We like to leave the foliage in place for the winter and cut it back in late February or early March. Summer. 22 in. x 30 in.